Why are some options greyed out and cannot be checked? Some mods not available or are not working under current WOT version. As soon as we have working version, we will put them back and you can check that option too. Options under "Premium options" can uncheck only PREMIUM users. For all others are these always ON. Should I uninstall old version before updating to new one? No. There is no need to uninstall before update. Installer is downloading very slow. As the popularity of webium's modpack grows, the servers are sometimes overloaded - especially at "patch days" when new WOT version is released. You can try to install it later or deselect downloadable mods (marked with DL in installer), but the recommended solution is to buy PREMIUM modpack with connection to high-speed server. Installer cannot find "audio" folder. How can I change, add or delete installed mods? After installation you should have a "Webium's Modpack" icon on your desktop. Double click this icon and select action from wizard - Change mods, Repair or Remove. For changing installed mods, you can run the downloaded ,exe file too. 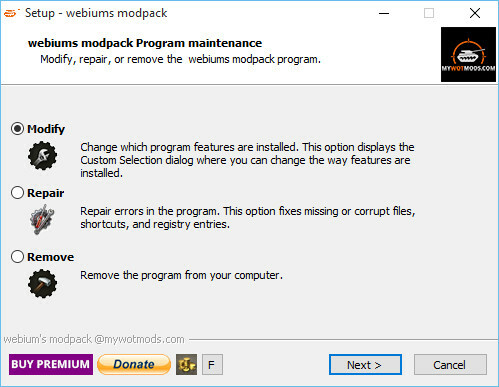 Latest version of Webium's Modpack is always available here. I see no mods after installation and the res_mods folder is empty. It seems like you have installed the modpack to the wrong directory. Be sure you have installed it to directory where your game is installed. If the problem persist, contact us in our forum. If you have problem with installation or with mods in game, you need to create a "Log Archive" and provide it to us. This tool will create a zip archive with all files needed for diagnostic and hunting the problem down. After running LogTool.exe provide webiumLogs.zip located in \webium\webiumLogs.zip. Put this file to our forum. If you have screenshots, provide them too. Detailed "How to" is here "How to create and send logs"
Check your upper right corner in Hangar - you should see small padlocks. Click on them to enable Free Experience and Gold. If the problem still persist, contact us via our forum.